Are you looking for the perfect live band for your next corporate event, or do you need a knock-out band for your Pensacola beach wedding? The best soca, classy calypso, rocking reggae and jamming steel drum music are just a click or phone call away! RythmTrail steel drum band has over 20 years of experience and is comprised of the top Steel Drum players in Florida, so you can ensure your event will be rocking to the soothing sounds of the best steel drum band on or off the beach. Whether it’s our complete six piece band or a more cost effective solo performance, RythmTrail’s native Caribbean music will make your beach wedding, corporate event or house party one that you and your guests will remember for years to come. So what are you waiting for? 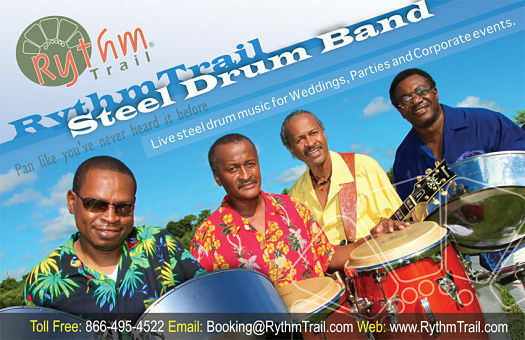 Transport your next event to the tropical islands with the classic sounds of RythmTrail steel drum band. RythmTrail offers not only beach wedding music in Panama City, but areas all over the state of Florida, nationwide and even internationally. From classy ceremony music for your special day to a creative and fun corporate event, RythmTrail can play it all and play it anywhere. Create your own personalized playlist of music and songs or let RythmTrail take control of your party and set the mood with romantic, upbeat or even dramatic music that suits all ages and audiences. Call RythmTrail right now at 866-495-4522 or get a quote online and turn your next event into a tropical island paradise. I want to thank you for the marvelous performance by RythmTrail Steel Drum Band. Your performance on March 21, 2014 let everyone know how versatile steel pans can be. You two had almost everyone in the ballroom out of their seats and on their feet. Chi Phi Chapter, Inc. of Chi Eta Phi Sorority, Inc.